One of the things I love most is exploring ancient homes filled with history and endless kinds of objects from the past. I can’t help but imagine the story behind each piece, or how the various inhabitants might have spent their every day lives. It is not something I often get a chance to do, but on our most recent visit to Tuscany, I was thrilled to explore the villa Il Cicaleto. 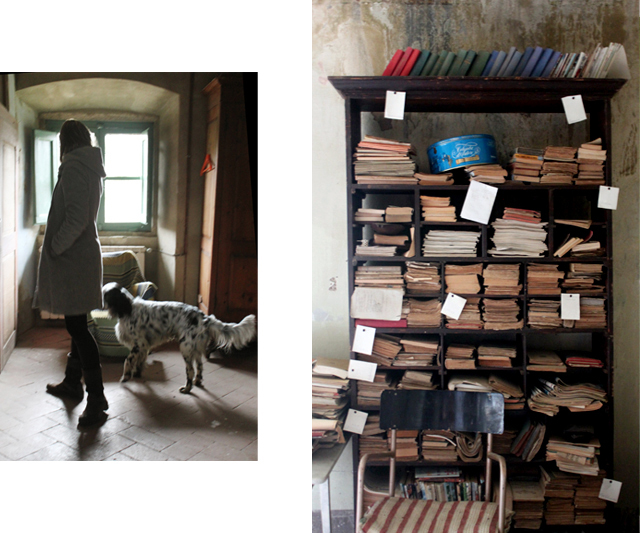 Pietro Ponticelli — who knows the stories and characters well — was the guide, and so Isa, Jacopo, Dero the dog and myself ventured into every single room of the house on a chilly winter afternoon. This beautiful villa sits atop a hill on the country road that leads from Arezzo to Sargiano. Surrounded by green hills and fertile land, Il Cicaleto was designed as the summer home for the Albergotti family, and was also a center of farming activity. Alessio di Albizo Albergotti had it built in the second half of the 18th Century on the site of a preexisting 16th Century villa. From the balcony on the main floor, a protected forest with rare tree species extends beyond the back lawn (pictured above). 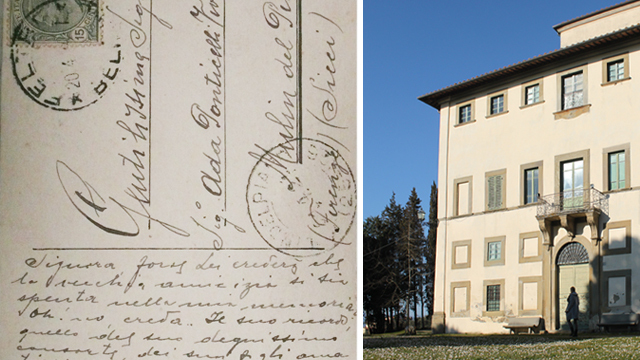 Considered an historical house for its cultural and physical significance, it is now owned by the Ponticelli family. Although no longer a family residence, Il Cicaleto can still be enjoyed by those who want to hold special occasions such as weddings, parties and reunions or simply for an afternoon in a beautiful Tuscan site. If you would like more information, you can contact Isa Cini Ponticelli. 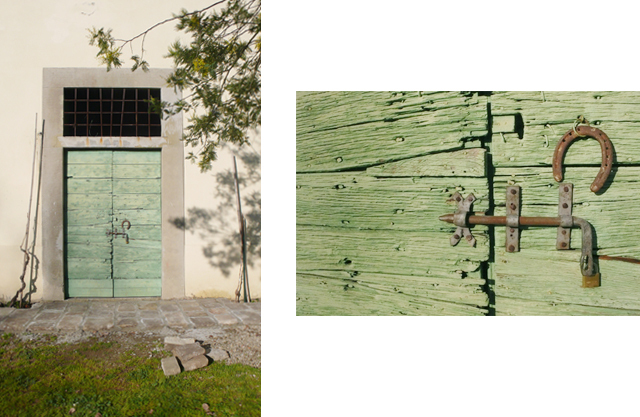 The image above is of the door that leads to the La Limonaia — The Lemontree House — which is the contiguous building to the villa. The first floor was used to store the lemon trees in the winter, and the top floor of La Limonaia were the living quarters of the people who farmed the land. 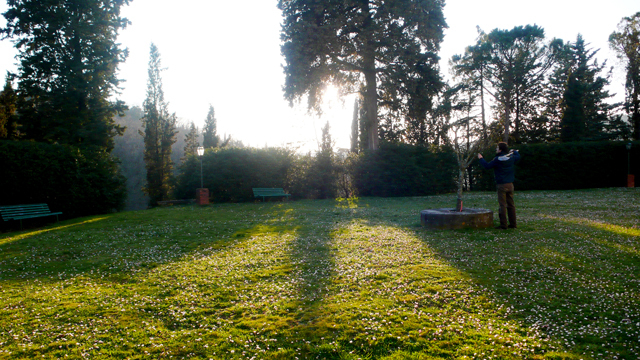 Below is an image of the villa as seen from the back lawn. A 19th Century art historian, Frappi, said of its construction: “It is enclosed in its entirety by four angled iron spurs, which in a game of volumes exalt its soaring construction”. We also found an old postcard addressed to Ada Ponticelli Vivarelli, one of the most recent residents of Il Cicaleto. She was the mother of Laura Ponticelli, who spent her summers at the villa for over six decades — at first with her mother Ada, later on her own — and even survived the most uncertain times. Because of the villa’s strategic position, during World War II it was invaded by the Nazis, who stayed — unwelcome — for a few months. Meanwhile, Laura and her mother continued to live there. At some point during the combat, part of the roof was blown off by the Allied Forces. The two women were finally liberated by the Allies and were able to resume their regular lives. Many helmets and other war artifacts from both sides in WWII can still be found throughout the house. The main entrance to the villa leads directly into the main hall. Walking into this ballroom gives one the sensation of steping back in time … you can almost hear someone playing the piano while the elegant ladies come in for the grand party. It might be the antique chandeliers, or the illustrated baroque doors, but I think that the painted wooden balcony is what really causes an impression. The high ceiling — it spans two floors — adds to the grandeur. 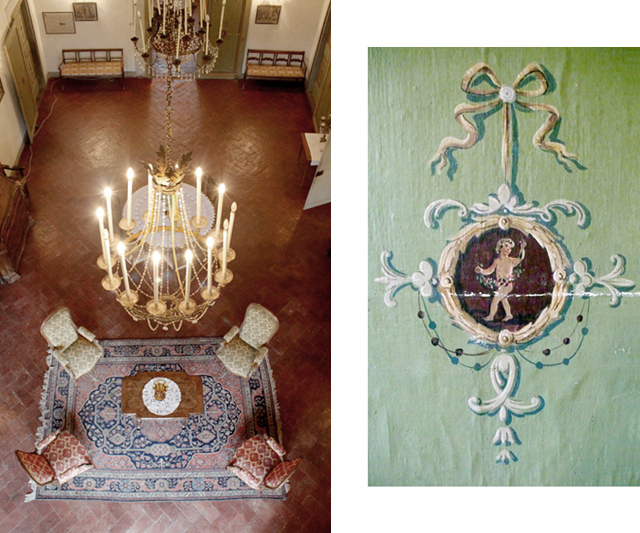 Below is a view of the ballroom from the balcony, and next to it a detail of one of the doors. The four doors in the main hall lead to the four entertainment and reading rooms. The study room, where we found the above postcard as well as a beautiful desk and ancient books. The resting room — in which I like to imagine the residents having afternoon tea while entertaining their guests — with walls covered by impressive frescoes (detail below). The memories room, filled with family portraits and where they might have sat and conversed after meals. At last, the music room with its grand piano, a gramophone — and a secret passage that leads down to the cellar. From this floor, there is a staircase that leads up to the living quarters with several bedrooms and two kitchens. 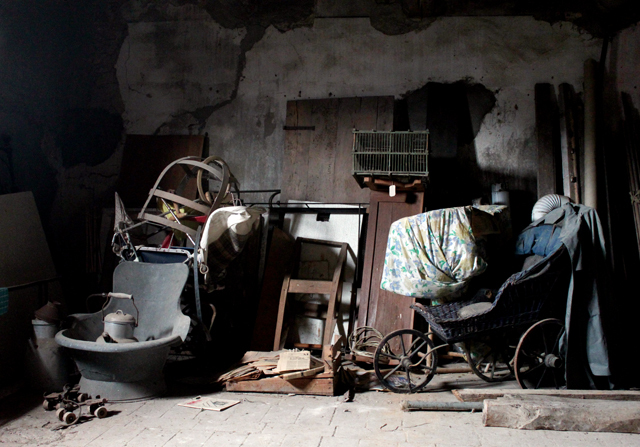 Continuing upward, we reach the attic, filled with myriads of objects — 19th Century baby carriages, newspapers, roller skates, birdcages, vinsanto, etc. A reminder of the many people that have passed by Il Cicaleto throughout the years. In this attic, there is a cross for a Belgian soldier from WWII. Laura had found the dead man on her front door and wanted to pay her respects by marking his grave with the name engraved on his tag. Once the war ended, she got in touch with the Belgian authorities to have the body repatriated to his home country — only to find out that the person she had buried wasn’t enlisted in the Belgian Army! He was likely a double agent, or as a spy, and had to work under a false identity. Imagining that this story took place at Il Cicaleto fascinates me. Il Cicaleto — which in Italian means “the field where the cicadas shrill” — is like a real-life museum, an enormous treasure chest. While exploring every room, I heard about the stories, the anecdotes, the romances and the lost loves of the people who spent part of their lives there. Seeing the clothes they wore, the things they made, the kitchen tools they used was all an infinite source of inspiration and a playground for the imagination. All the photos were taken by Jacopo Ponticelli and Ona Villier. 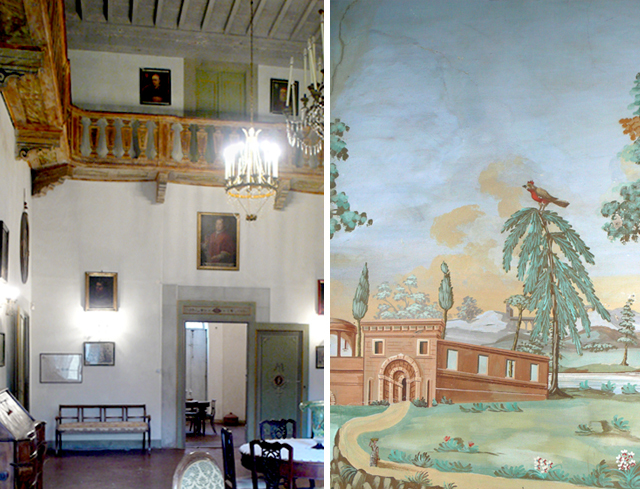 In the future, I hope to be able to post some images of the villa’s past inhabitants and visitors, as well as some beautiful architectural sketches from the 18th Century. This entry was posted in Uncategorized and tagged architecture, arezzo, binichic, history, home, tuscany, villa, wabi sabi. Bookmark the permalink. How wonderful. What a fabulous little adventure! I stayed in this house with Laura Ponticelli in September 1983!!!!!!!!!!!!!!! Wow! What an unforgettable experience that must have been! The Puppone brought me here with the other members of the neo-melodical group “Filofobia”. It was really fabolous. I hope I can be back to the villa! Perhaps next July 2012 … :-). I really would like to experience new neo-melodical events under the wisteria gazebo of the villa. Grande Michele, che bello sentirti su BiniChic! Anch’io spero che compartiamo nuovi eventi neo-melodici nel Cicaleto … sicuro a Luglio ’12! Abbraccio! Waht a delight to find a piece of Albergotti history by sheer accident, and I thank you, Binichic! Hi Judy, I’m glad you found us! The Albergotti were a very important family from Arezzo — a bit like the Medici’s in Florence. I found this site again by accident. I am an Albergotti, from Ulisse Antonio Albergotti who came to South Carolina in 1732, approximately. I love to discover old connections between the Aretine family and the South Carolina one. We’re glad you found us again! Discovering ones’ family tree is very exciting — you should stop by Il Cicaleto if you’re even in the area.